Cornelius Erickson Obituary - Newark, Delaware - R.T. Foard & Jones, Inc.
Obituary for Cornelius James Erickson, "Jim"
Our amazing Dad left us to join our Mom, Jane, his golf partner and beloved wife of 60 years on Saturday, March 16, 2019. We know that he and his "Irish" celebrated St. Patrick's Day together. Dad was born in New Kensington, Pennsylvania on January 21, 1926 to Cornelius Julius and Beatrice Kathryn (nee Cosgrove) Erickson. Along with Dad's parents and wife, he was predeceased by his brother, John and his sisters, Bernadine, Katherine, Suzanne and Patricia. When Dad turned 18, he graduated early from Ken High, joined the army and proudly served in the Army Infantry during World War II with the 86th Blackhawk Division in Central Europe and the Rhineland Campaign. He was wounded by friendly fire and was in a British hospital on VE Day and said it was quite a party. Dad returned stateside and used the GI Bill to attend and graduate from Carnegie Tech with a B.S. in Electrical Engineering. After graduation Dad was commissioned as a 2nd Lieutenant in the Army Corp of Engineers. While serving with the 92nd Searchlight Company during the Korean War he was wounded by mortar fire. Just recently we learned that he was superstitious about Friday the 13th as both his wounds were inflicted on that particular day in 1945 and 1951. Dad was proud to be an Electrical Engineer (just ask his grandsons who chose other engineering disciplines!) and in pursuit of engineering excellence Dad chose to continue his education, obtaining a Master's in Electrical Engineering from the University of Delaware. Dad was Principal Engineer at DuPont Design Division for 37 years and was renowned as an electrical heating expert. He belonged to the Institute of Electrical and Electronics Engineers (IEEE) where he was a Life Fellow, was a presenter of many technical papers and was a contributor to the code of national standards. Dad was awarded the Outstanding Achievement Award in 1995 from the IEEE Industrial Applications Society and in 1998 received the IEEE Medal for Engineering Excellence. He was a member of the National Electrical Code Making Panel #12 from 1975 to 1995. Dad was on the committee that drafted legislation to establish the Delaware Association of Professional Engineers. After retirement, he authored the "Handbook of Electrical Heating for Industry", published by the IEEE Press in 1994. Dad loved his work, but really loved his family. His words of wisdom and sense of humor will be missed. His daughter, Margaret Erickson-Menton, her husband Dennis, their 4 children and 3 grandchildren will miss watching sports and Lawrence Welk with him-and chairside candy! His daughter, Mary Gorski, her husband Mark, and their 3 children will miss his winters in Texas, drinking Manhattans, after dinner music and museums. His son Jim and his twins will miss golfing, Pirates, Steelers, and will treasure memories of shared Sunday meals. 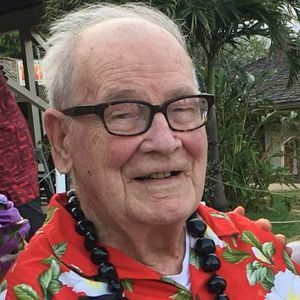 His daughter, Clare Vosteen, her husband Dave, and their 4 children will miss living with Dad, discussing history, watching MASH, nightly scotch and joking about the dogs. His daughter, Katie Korka, her husband John, and their 5 children will miss daily phone calls, honoring him at military ceremonies, taking him for yogurt and the "Boys Couch". We were blessed and loved. A viewing will be held at R.T. Foard & Jones Funeral Home, 122 West Main St., Newark, DE 19711 on Friday, March 22nd from 6 pm to 8 pm. The rosary will be said prior, at 5:30 pm and all are welcome. A Mass of Christian Burial will be held Saturday, March 23rd at 11 am at Holy Family Catholic Church, 15 Gender Rd., Newark, DE 19713. Interment will be Monday, March 25th at 11 am at the Delaware Veterans Cemetery, 2465 Chesapeake City Rd., Bear, DE 19701. In lieu of flowers, the family requests that you make memorial donations in Dad's honor payable to "St. Peter's Cathedral School" and send in care of the funeral home. Add your thoughts, prayers or a condolence to Cornelius' guestbook. In lieu of flowers, the family requests that you make memorial donations in Dad's honor payable to "St. Peter's Cathedral School" and send in care of the funeral home. Please enhance this tribute to Jim by adding your memories and photos.